Grow Smart RI is recognizing The Design Exchange with an “Outstanding Smart Growth Projects” award. The distinction was presented at the 2015 Smart Growth Awards at The Ballroom at the ProvidenceG on May 21. “Each year, passionate, creative, and resourceful Rhode Islanders show us the way to tap our state’s full potential through projects, plans, and policies that play to Rhode Island’s strengths and generate enduring economic benefits—both statewide and in specific neighborhoods,” stated Grow Smart RI’s executive director Scott Wolf about the celebration, now in its fourth year. The Design Exchange—a new collaborative work community in downtown Pawtucket—is located in a historic, four-story mill that was once part of the Rhode Island Cardboard Company complex. 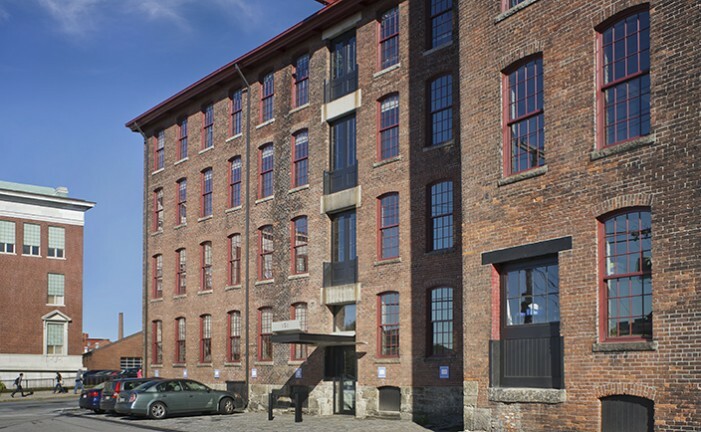 Constructed in 1880, the restored building is now occupied by eight creative businesses including graphic, industrial, and interior designers, photographers, textile designers, and engineers—vibrancy that has been drawing visitors and economic activity to Pawtucket’s arts district. Bartels and her Partner Chris Ladds developed and renovated the historic mill, which previously sat vacant for over 30 years. “We spent a lot of time getting the economic model to work and ensuring that it was a smart investment,” stated Bartels, who added that state and historical tax credits significantly contributed to the project’s economic feasibility. Established in 1998, Grow Smart RI has become the leading advocate for sustainable economic growth, revitalization, and improved quality of place in the state’s urban, suburban, and rural communities. The Design Exchange’s nomination to receive the recognition was submitted by the Pawtucket Foundation, recipient of this year’s “Outstanding Smart Growth Leaders” award. View Grow Smart RI's celebration of the Design Exchange here.